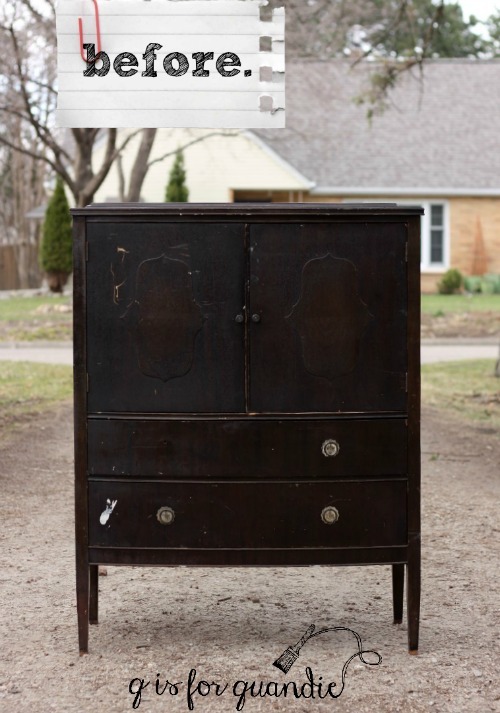 Way back in April, I purchased this dresser via craigslist. As you can see, it was in pretty rough shape with splotches of white paint here and there. There was also a broken leg that you can’t quite see in the photo. Depending on the brightness of your computer screen, it may almost look black in this photo, but it’s just a really dark stain. I call pieces with doors that open to reveal inner drawers a ‘linen press’. I can’t find an authoritative source online that confirms that, but if you google ‘linen press’ you’ll get lots of images of pieces like this. So let’s go with it, OK? I’m a big fan of the linen press. This is the 4th one I’ve done (you can see the others here, here and here). However, they do tend to be a bit more work because you have to paint the inside too. In this case, I painted the inside in a custom mixed Navy Blue Fusion paint (equal parts Liberty Blue and Coal Black). I love using Fusion paint on the interiors of pieces for a couple of reasons. First, it doesn’t have to be top-coated (adding wax or another topcoat inside a cupboard can be a real pain) . 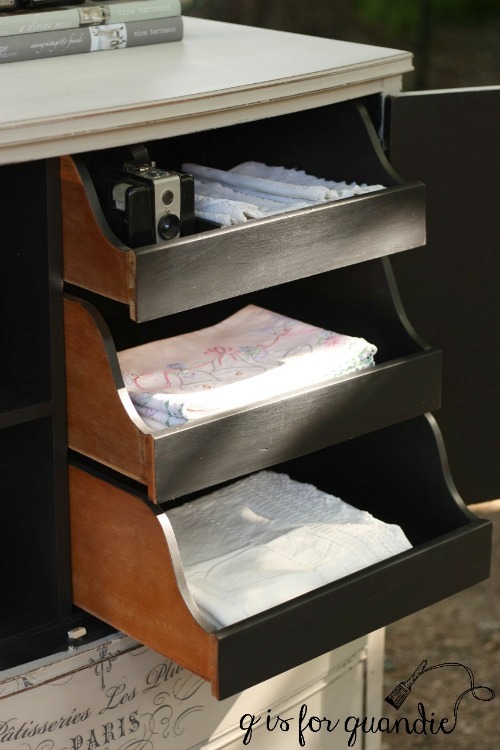 Second, it’s fully washable which can be handy with both drawers and shelves. I purposely chose not to do so because these drawers fit pretty tightly. Adding paint to them would have likely caused them to stick. In addition, the paint would have gotten pretty scratched up over time. I don’t care how durable your paint is, having it rub against another surface like this will scratch it. 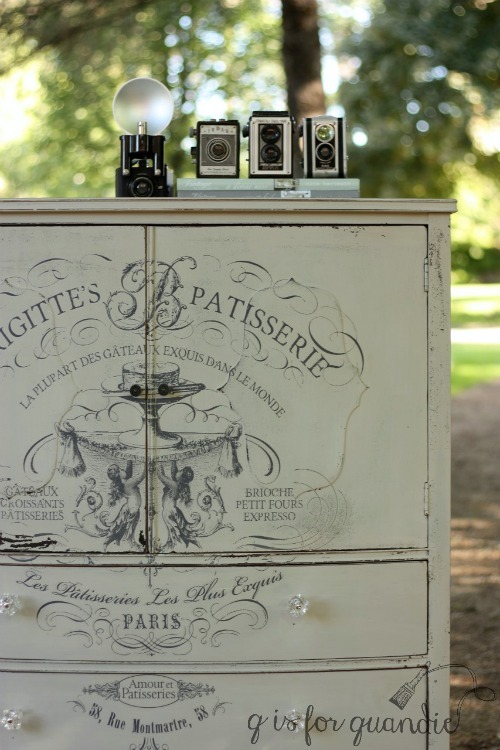 I love these drawers for storing pretty vintage linens. But I bet you are wondering what I did with the outside. You’ve gotten a little glimpse of it so far just to tease you. OK, OK. I painted the outside with Homestead House milk paint in Bedford (paint provided compliments of Homestead House). This color is a lovely pale greige; not quite grey, not quite beige, but a perfect blend of the two. Then I added another gorgeous Iron Orchid Designs rub-on furniture transfer (you can find these from various sources online). This is a good time to caution you about mixing chippy milk paint and a rub-on. If your milk paint is fairly chippy, or in other words it’s not well-adhered to your surface, it may come off with the transfer backing sheet. Basically, instead of the rub-on sticking to your dresser, the paint will stick to the rub-on … does my explanation of that make sense? You can see where I had a little trouble with that on the bottom of the door on the left (in the above photo). The key to using a rub-on with milk paint is to make sure you prep your piece really well (scuff sand and clean with TSP substitute) to limit how much the surface resists the paint. Especially in the area where the rub-on will go. Oh, by the way, I switched out the original pulls on the bottom two drawers because I was missing one of them. I chose glass knobs because I wanted them to fade away and let the transfer be the star of the show. One more comment about applying the rub-on. For the bottom two drawers, I cut the transfer apart and did each drawer separately. I did that because I needed to adjust the spacing vertically just a tad to fit the drawers. For the top half of the dresser, I placed the full transfer over the shut doors and applied it that way. I debated cutting the transfer in half down the middle, but I think that would have messed with the design. I didn’t want a weird space down the middle. It was a little putzy to do it this way, but I’m glad I did. My advice to you if you are going to try this is to be patient, go slowly, and don’t remove your taped on transfer sheet until you are sure you have the entire design transferred. I usually leave mine taped to the surface at the top of the sheet so that I can pull it up slowly, and potentially let it fall back in place if I find I missed something. 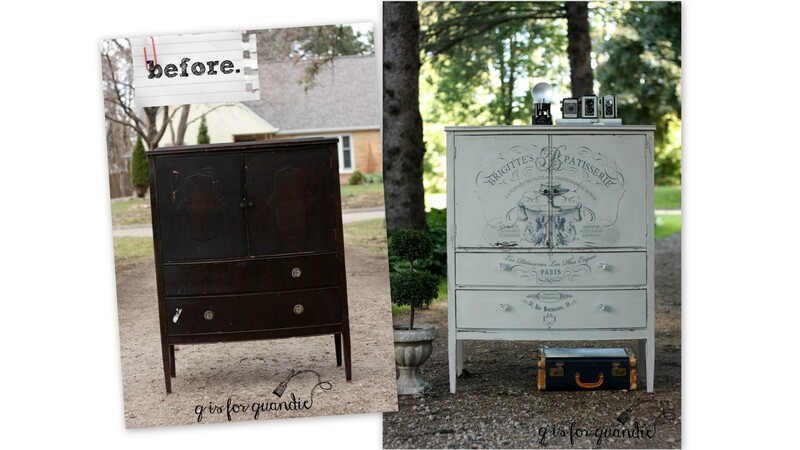 By the way, I used Miss Mustard Seed furniture wax as my top coat on this dresser. I waxed right over the transfer using a light touch and it worked beautifully. So there you have it, the Bedford Linen Press. And of course, this piece is for sale locally (while it lasts). Be sure to check my ‘available for local sale’ page for more details. Sharing at Silver Pennies Sundays! It’s stunning! Love the interior too. I’m a sucker for anything with little drawers or compartments. Thanks Becky! 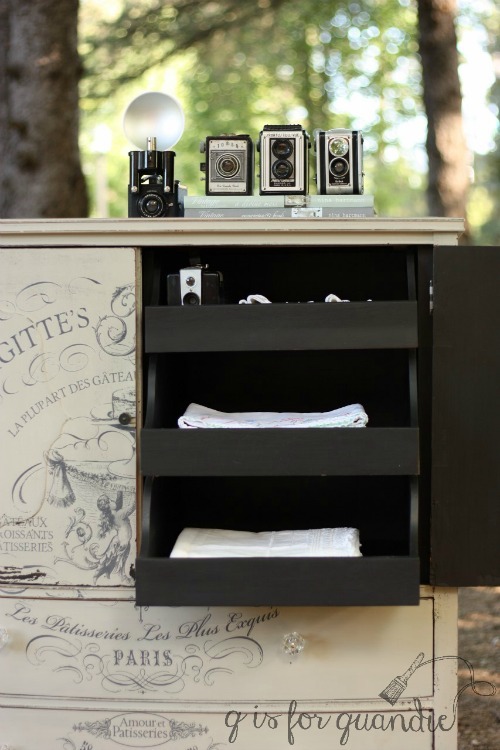 I think those little drawers and shelves would make this perfect for a craft room too, don’t you? Love it! You really know how to spot a gem. This piece is absolutely stunning — like all your artistic work! Thanks so much Joni. I am really loving these IOD transfers. They add so much to a piece! Ah here it is! See, I knew you would figure out how to save the piece. 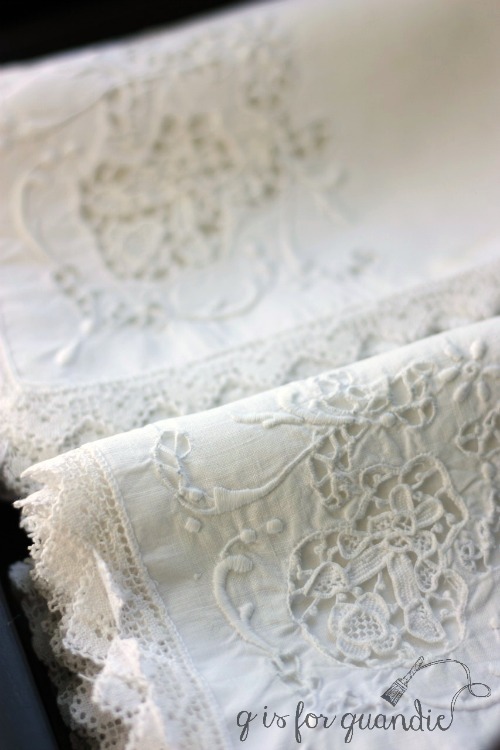 Really beautiful, and especially with the linen. Actually this is a different piece. I haven’t shared the ‘problem’ piece here on the blog yet! This piece is stunning! The detail work is exceptional. I don’t know how you give up any of your work as they are all beautiful. Fantastic results Linda! These transfers you are using are just amazing. I love how you used a contrasting paint on the little pull out shelves/drawers things. Exterior color is perfect as well. I don’t know how you decide what to keep and what to let go. If I’d had a spot and/or use for this one I would have been very tempted to keep it. Really, that’s usually the deciding factor. With the Belgian bed bench, I had just the right spot for it. With the Specimens cupboard, I had the perfect spot and it’s supremely functional for paint storage! So every once in a while one comes along that I have to keep, but I can’t keep all of them! Quandie! You rock! How do you work so quickly? Magic pixie dust? Lack of a social life? I’m an early riser? I have help (Ken for fixing things!)? Multi-tasking? I think it’s a little bit of all of the above. This particular dresser was completed over a week’s worth of evenings. I prepped and painted the first coat of paint one evening, 2nd coat the next, sanded and applied a transfer the next, and finally waxed on another. I’d say each step didn’t take much more than an hour, in some cases less. You’d be surprised what you can accomplish if you just chip away at it a little at a time. AMAZING ! Perfect choice of paint and decoration ! Simply beautiful. I bought that same stencil and was waiting for the right furniture piece to apply it to. Thank you for the information about putting the transfer on milk paint. 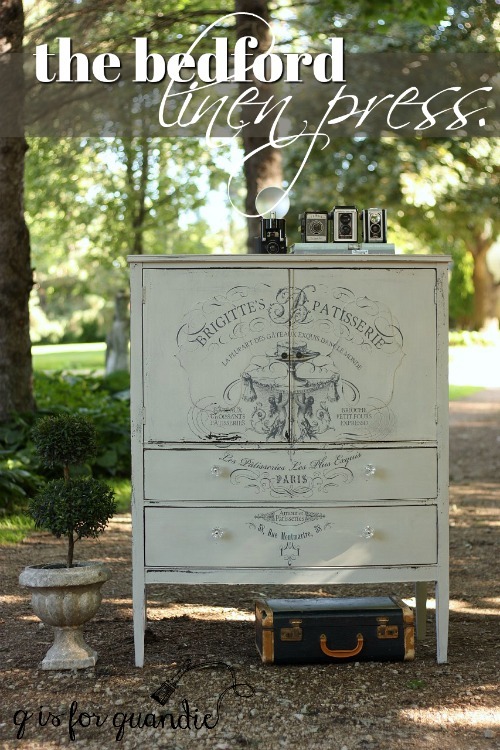 I have a hatbox dresser that I am doing right now in milk paint and was going to use one of my transfers on it. Good to know before I tried it. I am sure you saved me once again! I love the color. Thanks for that bit of info! Hi Nancy! Yes, there is a sort of halo around the edges of these transfers. In my experience it’s more visible when looking at the piece on an angle rather than straight on. You can see that an example of that in this post. It’s also more visible with colors other than white. That being said, when the light hits it just right I can still see that ‘halo’ on my own white specimens cupboard when I look at it from the side, although it doesn’t show up as much in photos. I’ll be posting soon about trying to use a transfer on a dark green color. The halo was really noticeable then, and I didn’t like that result at all. So I would definitely avoid darker colors. I also think the ‘halo’ effect is a result of a difference between the final sheen of your paint v. the sheen of the transfer. 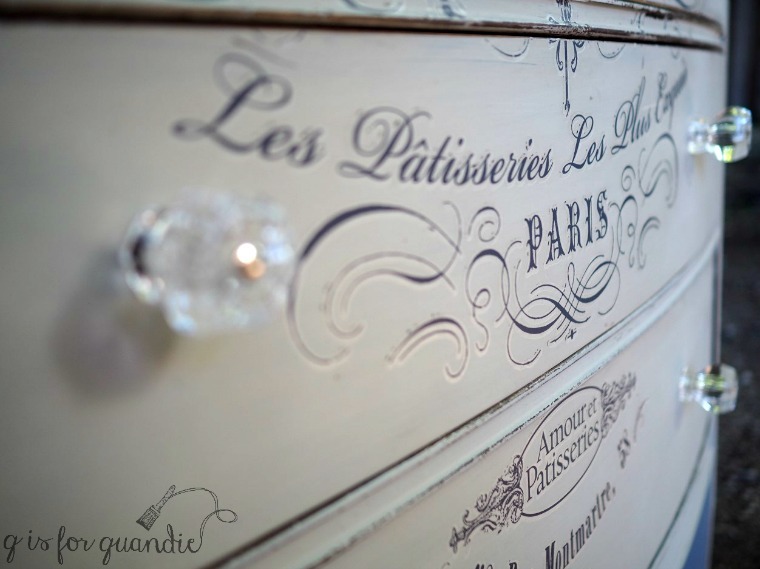 If your chalk paint was really matte or flat, the sheen of the transfer is going to contrast with that and be more visible. Did you put any kind of top coat over the transfer? You can wax over it, if you are waxing your Annie Sloan. All of that being said, I don’t have a problem with the mild halo effect that I see on the Blue Alligator dresser or the Specimens Cupboard. I’m a big believer in not trying to achieve perfection, but rather focusing on character. Thank you Quandie for explaining to me about the halo effect.I did not put the Annie Sloan wax on the piece yet but I certainly will. I was just so surprised to see the halo because I watched IOD transfer video and the Purple Painted Lady “How To video”s and no one mentioned their would be a halo. So I will try to stick with the white shades of paint when using these transfers. Thank you! Thank you! After answering your first comment Nancy, I reached out to Sally at Iron Orchid Designs and asked about the ‘halo’. She said they are working on improving their product to minimize that halo, but in the meantime she recommended distressing the transfer lightly using a fine grit sandpaper to help blend the edges of it (in addition to using the transfers over light colors; the halo will be worse over darker colors). I did lightly sand over the transfer on this piece and looking at it now I do believe the halo is not as noticeable. 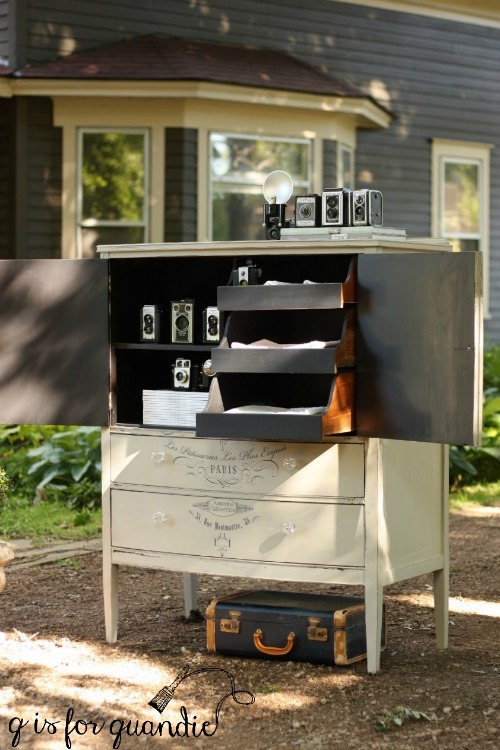 Hi Linda, I just received your email this morning regarding using the IOD transfers on the painted bayberry chest. It was the BEST explanation ever on how to use the transfers! It was so disappointing, on my first try using the transfers to see the halo. I just purchased over $200 worth and then realized after my blunder that most of the photos posted using the IOD transfers are on white furniture. I don’t know how to attach a photo or I would show you but pretty much looked like the photos you posted of the bayberry chest. You are so right, it doesn’t have to look perfect but on a color it looks too much like a decal. By the way, I used ASCP color country grey which isn’t very dark so that doesn’t work. I painted a piece Paris gray with a white wash so I guess I will use a small piece of the “Memories Transfer” and test it before I ruin the whole transfer & have to do a lot of sanding to remove the damage. 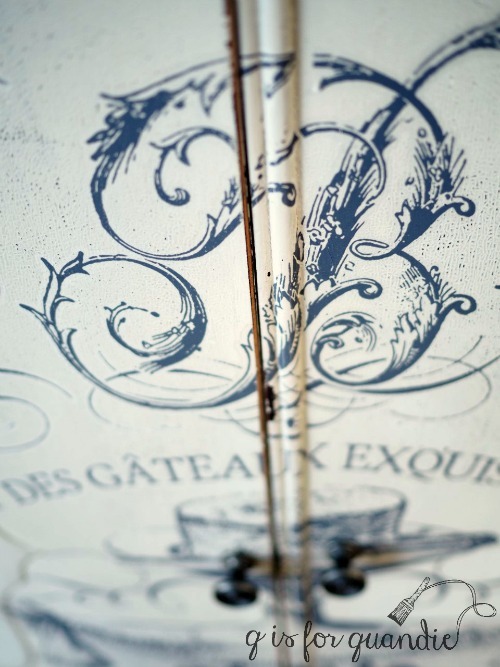 I absolutely love the furniture pieces using the Graphic Fairy french script but my goodness what a job that is to do. After transferring the design with a pencil, I tried using a paint pen, letting it dry and waxing the Annie Sloan wax. It still smeared slightly so I guess I need a better paint pen or different sealer. I hear you Nancy! I think all of the different methods of adding a large graphic to a piece of furniture have their pros and cons. I wrote a post about the various methods here. None of them are perfect. As for paints pens, I’ve never found one that gave me the look I wanted in the end (I find them difficult to control and get a crisp, precise line). It’s a bummer that you were disappointed by the look of the transfers after spending so much! I will say that I still absolutely love them on lighter colors. I’m just finishing up another piece with a transfer, this time over a very pale blue color. I followed Sally’s advice and sanded it very lightly with 220 grit sandpaper and I think it looks great. Be sure to take a look when I post it in the next week or two and see what you think! Thank you, Linda. I appreciate the link on the various methods of doing transfers. I love what you did with this. I had to do a double take! My husband had a piece that was very similar to this in his apartment when I met him and we both kick ourselves that somewhere along the way in our moves it must have gotten left behind! Thanks Theresa! This was such a pretty piece and the transfer was perfect for it. On a side note, I’m reading Leave No Trace this week and so far loving it!